Tradition would have it that the name comes from Flora, Pompeo's lover, but more likely it comes from the fact that in the late 1300's, the piazza was abandoned for a brief period, and became a meadow. Since 1869 it has been the home to a vibrant and colorful market. 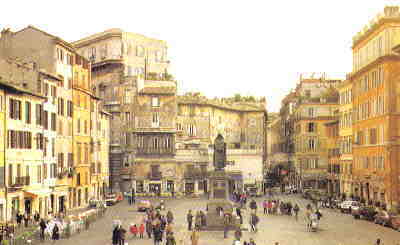 In the center rises the monument to Giordano Bruno, who in 1600 was burned here at the stake as a heretic for contending that the universe has no center.